The Ministry of Defence is looking at how it can improve the accommodation offer for service personnel, to make it fairer, and more flexible, whilst keeping it affordable for the MOD. The Future Accommodation Model (FAM) will apply to personnel with families and those without, whether they are single, in a relationship or married. It will apply to all regular service personnel and full time reserve service (full commitment) assigned to or at FAM pilot locations, with four or more years’ service. GOV.UK has a section that is continually updated including video clips, entitled What you need to know about FAM. 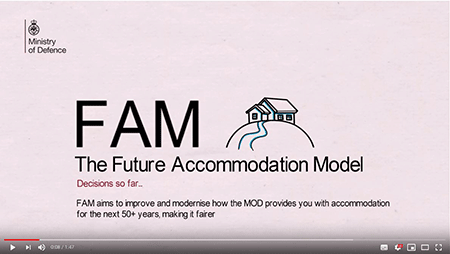 You sent in your latest questions on FAM and the People-Accommodation team at MOD have answered them for you.